Murchison-Hume was created by former Fashion Editor and mother of two, Max Kater when her son developed allergic sensitivities to common household cleaning products. She made it her mission to create cleaning and personal care products that would be safe, easy to use, beautiful, and effective. All of their ingredients are of the highest quality and their formulations are designed to be highly effective, while maintaining product safety and stability. 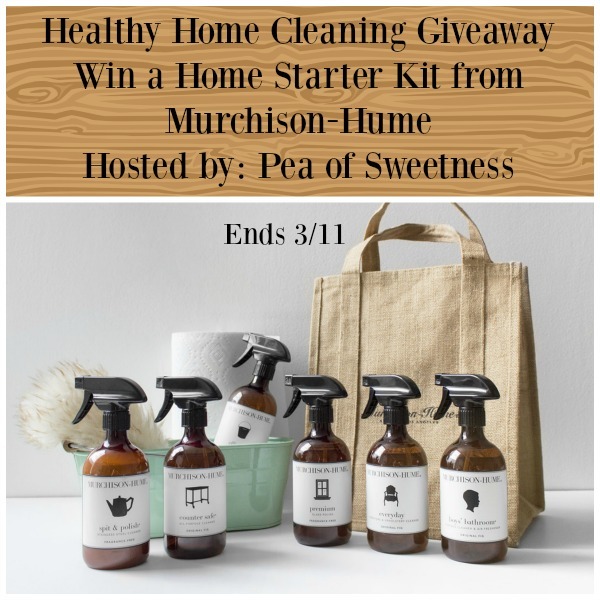 See what Emilee at Pea of Sweetness thought of the Home Starter Kit from Murchison-Hume. These products are perfect for your home when you want to keep things clean and stay healthy at the same time! Great prize pack to win here! Next post: Have you seen the Pura Vida Bracelets? I really want to try the “Spit n Polish”!